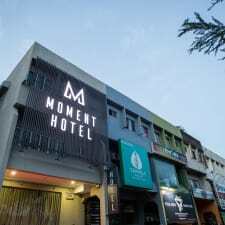 Moment Hotel PJ is located in Uptown Damansara Utama, Petaling Jaya and provides guests with free Wi-Fi. It is conveniently positioned for guests wishing to visit the area's popular attractions. The hotel offers 22 air conditioned rooms. They are also fitted with cable/satellite channels and a shower. Advantage of the hotel is it's location. Along the street walking has plenty of eatery cafes & pubs. Behind the block, there's a Muslim Indian coffee shop serving all kinds of Muslim food & roti platter 24 hours. Across the road from the coffee shop, Starling Mall, a newly opened shopping mall with plenty of restaurants, cafes & retailing shops. Not to mention there are plenty of Banks around the area with ATM machines. Kuala Lumpur International Airport is a 50-minute drive. Kuala Lumpur and Shah Alam are located a short drive away.